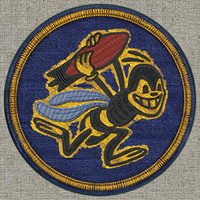 Longtime player, somewhat new forum poster. Forgive me for being bad at formatting. This is essentially going to be a giant essay. I'll try to space it out to be easier on the eyes. 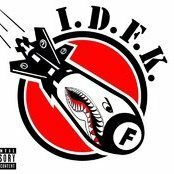 The Izumo. No matter what people think of her, she is well known. Especially by those who've played her. Izumo is notorious as the insurmountable last hurdle to getting the Yamato. But for a lot of people the grind is anything but smooth. I want to explore this more and figure out why exactly the attitude towards this ship is the way it is. In my experience when I first grinded her, Izumo was indeed a pain. But way back then I was a terrible player in general. I was bad at everything and Izumo was punishing my mistakes even more than usual. But let's for a moment assume that most people who personally grinded Izumo were actually competent at that stage of their play history, unlike me. Still, why does the ship get so much hate? 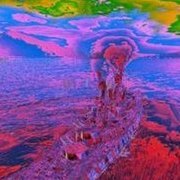 Is it all hearsay and bad reputation or is she really a bad ship, and if people are doing bad in her, why is that and how can they fix this? 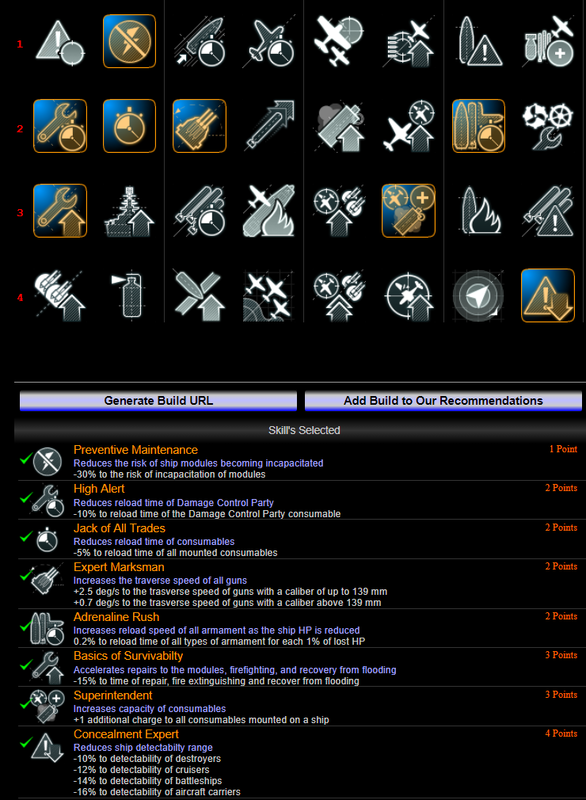 And to take a look at Izumo's glaring weaknesses. Her stock form is atrocious, ugliness aside(I actually like the C hull's look a lot), you are going to have a rough time with Izumo's initial stats. Let's go down the line. Speed: 27.1 Kts. You start off around the same as the other T IX BB's but you stay the slowest out of stock. Rudder Shift: 26 seconds. Every BB at this tier starts out equally as bad, but Izumo is still the worst. Out of stock is a bit more playable but the competition still leaves much to be desired. Especially since other BB's can afford rudder shift upgrades where Izumo is forced to use damage control for reasons that will be addressed. Concealment: 19.26 Km Absolutely atrocious. The worst stock value in the game. Now here is possibly her biggest weakness of all. She is covered in 32 mm plating from bow to stern and has a wide open deck. This means that any cruiser or RN BB will see you as food and boy will they feast. Not only from fires but from HE pen as well. Your only chance of protection is if shells hit your turrets. Which isn't desirable, as they are all in one spot and if they are knocked out you lose a lot of firepower. The above alone is enough to easily make people hate their experience and disown the Izumo for good. Not to mention in updates past she had absolutely unusable guns as well. Now Lets focus on what the Izumo does well. Which is surprisingly a lot of things. First Izumo has very good guns. These things hit hard, and are reasonably accurate. Izumo's guns tend to hit for high damage very consistently from steep angles sometimes. But it's her turret traverse that is her sweet spot. Compared to Yamato, and some of the other battleships in her tier Izumo has very fast turning turrets. Stock, they turn 180* in 40 seconds flat. With Expert Marksman, this goes down even further to 34.6. With Main Battery mod 2 even further to 30.6. Additionally you can run MBM 2 and 3 simultaneously to enjoy a 27 second reload and 34.6 traverse. In short these are very responsive guns that unlike their more responsive German competition, are very accurate. Even sans the aiming systems upgrade. This is a far cry from Yamato's turret ergonomics, which in my opinion are Yamato's biggest weakness. Personally I think these responsive turrets make up for the awkward no. 3 Derp turret, or at least make them in line with other 3 turret battleships that can enjoy firing directly to the rear. Now her outer Armor scheme is very bad but her internal armor scheme is pretty good. A near submerged citadel with a nice beefy belt covering it. Additionally, similar to Amagi, Izumo also has a nice thick rear armor belt. This may not see much use, but it is interesting nontheless. Now taking all this into account, let's try to assess whether or not the Izumo is really a bad ship or not. Her atrocious concealment can be brought down to a playable amount somewhere around 14 Km. (forgive me as I don't have a fully specced captain for her at the moment.) This mitigates one of her worst weaknesses to a good enough level that lets a skilled player position themselves into a good place to stay alive and be effective. In fact some unicum Youtubers recommend using hard cover in Izumo as much as possible. Damage control 1 and 2 is absolutely required to make this ship be playable, and if you have the spare points, Basics of Survivability and India Yankee flags will bring fires down to a very manageable level. This doesn't fully solve the weakness against HE, but in a big ship like this. These modifiers will help a lot. You could go a step further and take Fire Prevention, but unless you have an uber captain I would take Concealment Expert over this, given the choice. 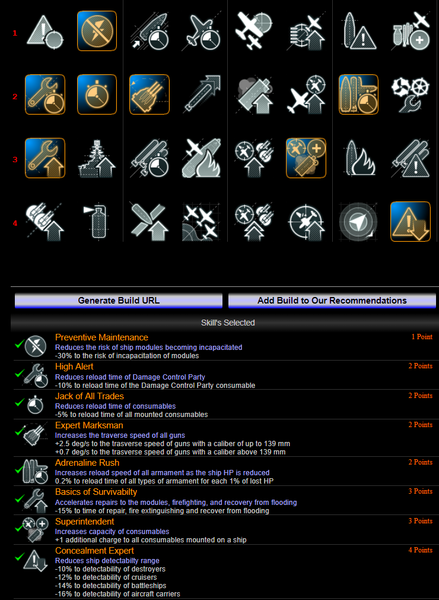 So between fire extinguishing modifiers and good positioning, a lot of Izumo's worst weaknesses can be patched up. In my opinion the strengths above will shine through the best this way. Which makes her an absolutely acceptable Tier IX Battleship. 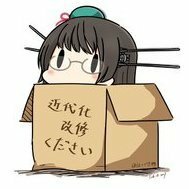 Now by no means is she the best battleship or even Tier IX battleship, but I see no reason why Izumo isn't a perfectly acceptable grind to Yamato. Besides, in the current meta battleships carry a lot of weight. Izumo has a bit of a higher skill floor to do acceptable in her, but played right can do her job. Speaking of her playstyle, I find Izumo to have an interesting one. Basically you need to hang in the back or behind hard cover preferably and take potshots at people. Once the battle reaches a certain point you can throw your weight around and help mop up and carry the team to a victory. Other ships like Kurfurst are better at this, but Izumo does just fine with it. And that's it really. My final thoughts on Izumo, that she's fine exactly where she is right now. She doesn't need buffed or nerfed or replaced. She is tough to play, but that doesn't mean she is bad. I think she does her job fine as the final gatekeeper to Yamato. The Wiki here also brings up an interesting thing. She essentially can outdo Friedrich at range, and beat Iowa in a brawl. So I think she has a good place in the meta. Here are some captains builds at different stages that I think will help this ship a lot. Especially for anyone new to the ship or struggling with it. This is what I would recommend a new player try to use first on their Izumo also taking into account future Yamato play. It's nothing special really. 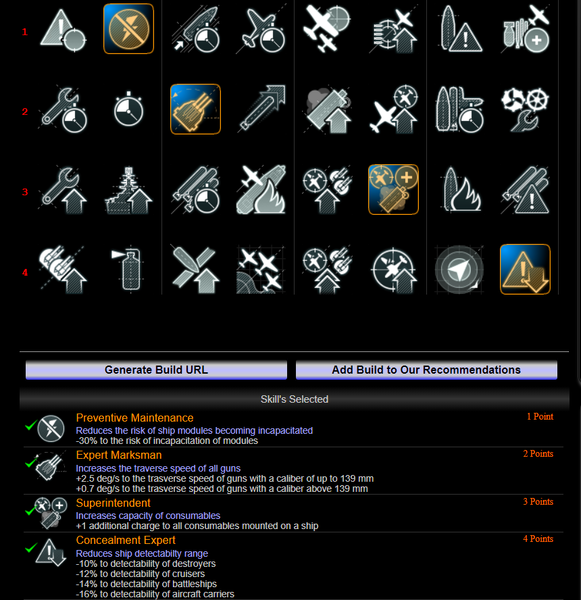 Most Battleships need these core skills. I assume by tier IX a player would have at least 10 points. To a player who has a spare captain with a decent amount of points wanting to use Izumo, I would use this. The Basics of Survivability and High Alert will be very useful for keeping this ship alive especially with damage control and India Yankee. 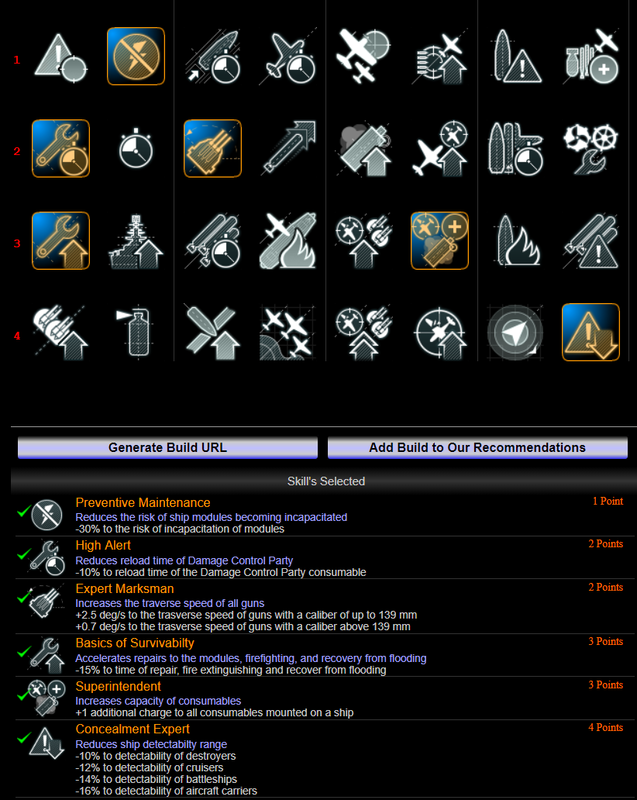 If you, like me, have a soft spot for underdog ships performing their best, then these 19 point builds will push Izumo to it's maximum usability. The first one uses Jack of all trades to push that repair cooldown even further as well as your heal too which can be beneficial. And uses Adrenaline rush to capitalize on Izumo's low reload (assuming you went with MBM 3) and the idea that shes going to take damage in every match, so might as well benefit from it. You can also forgo AR and Jack of all Trades for Fire Prevention if you so choose. But I wouldn't personally. DISCLAIMER for those who want to say "your stats are garbage therefore your words have no weight." Fair enough My stats are bad. Most of them accumulated during my awkward player phase where I did not care one bit about improving myself. This isn't true now, but my stats are still bad. However they are increasing, which means I am improving. It just takes time. Have a nice day, and thanks for reading. It's lowest in WR for T9 BBs and second lowest in DPG behind Iowa. So, yes. It's a bad ship and could use a buff. It's main problem though is that for most people it's simply not a fun ship. Personally I don't think the skill of the playerbase has any effect on whether or not the ship is good or bad. I subscribe to the belief that every ship is good if played right. Even if it's not the best. Agreed with @Lert. I'm one of those people who didn't have too much grief with the grind, but it's not a particularly fun ship to play, you're basically playing the role of an island fortress that can be sunk by torpedoes and usually can only use 2/3 of your main guns. The Yamato isn't that much better in terms of playstyle, but it does everything a bit better and the pain is mitigated by having much punchier guns which have a fun factor all of their own. The Izumo might not be terrible, but for nearly everybody, even if they play it well, it's just a grind they need to get through to get to the ship they're really trying to play. Moreso than any other T9 battleship. @K538Fair enough. I'm glad you agree it's not a terrible ship. I don't think it's the most amazing ship out there either. But I do have a soft spot for it. I've rebought it since selling it to initially pay for Yamato, and I have to say it's a pretty enjoyable ship. Who am I to judge? Of all the fetishes in the world this is far from the worst! I LIKED her, and do watch the Flamu vid on her. I will get her back down the road I am sure of it. But yes a buff would be nice. Izumo is disgustingly bad, with no real reason for it to be so other than provide a speedbreak to Yamato. I skipped the last half of the grind. I've had good games and bad games in her. I had the Dunkerque before I got the Izumo, and have since picked up the Nelson. I think alot of the issue is the unusual position of the main battery. Once people can get over that, then the ship becomes situational. The biggest problem with Izumo is that the C turret faces aft, unlike Nelson's, which faces foward. This makes it extremely awkward to use. Nelson can get all 9 guns on target comfortably without giving too much broadside, and Izumo cannot. Izumo is not good. It is also boring as Lert says, which is probably its main crime. It plays exactly like a Yamato, just poorly. Yamato isn't that exciting to play itself (though in part that is due to the joke that is the high tier meta), but at least it is good at the whole "virtually stationary barge with guns" thing. 60% WR during the grind...still hate the Izumo. The main issue with Izumo is: huge and slow target covered by 32mm of plate armor. 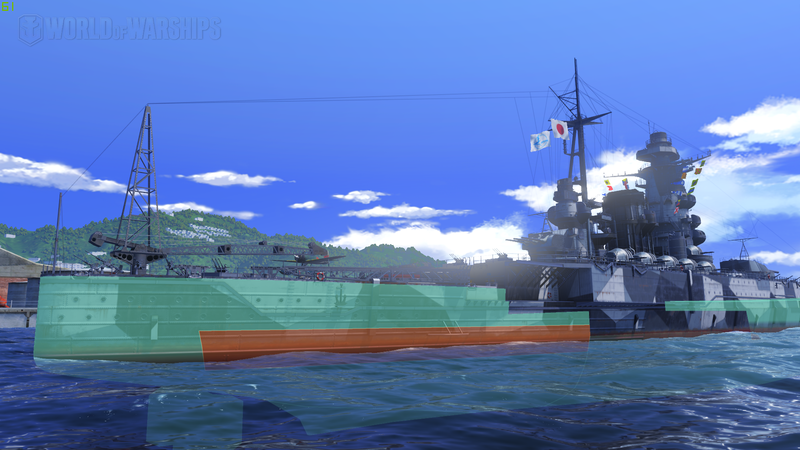 Izumo is huge, slow and has terrible concealment. So, you are not runnming away or hidding from the enemy. To make things worse, Izumo is covered by 32 MM of armor, wich means that HE spammers eat you alive. You cant run, you cant hide and you cant tank. The good thing about Izumo? The guns are really good. I've found all of the above to be true, except the guns are poor as well. Despite being clustered on the bow, they don't benefit from it in accuracy like Nelson and Dunkerque do, and instead they scattergun like the woefully inaccurate Amagi, albeit not as badly. It does nothing well. I've found the guns to be vastly inferior to the guns on my Iowa, especially at long range. They have an awful dispersion pattern that is forever splitting the shells short and long for endless frustrating brackets, just like Amagi. 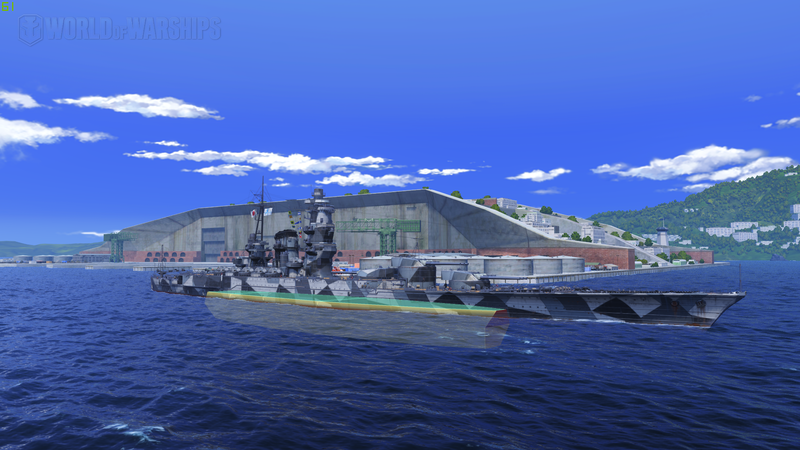 Only difference is Izumo is netting me more single shell hits over total misses. Tier 8s have essentially the same MM result as tier 9s, which is t10 matches 90% of the time, and there's not a chance in the world Izumo could even approach my North Carolina for effectiveness, let alone anything higher. I had a terrible time with a Izumo. It's fun to turn bow-in and tank the world, but once you turn in, there's almost no extracting yourself. The guns never clicked with me. Of course you're visible from the next map, so most of the time I only had enemy bows to shoot at. At close and long range, dispersion really let me down countless times. Perfectly aimed shots at cruisers splashing all around them or waterline broadside shots all just falling into the drink. It can have its moments when your bullets stay together and you bait enough side to get some AP bounces. This doesn't happen often and the vast majority of the time you will be feeling pretty powerless. Like others have said, the Izumo is very vulnerable to HE. It's slow, has terrible concealment, is enormous and has very thin deck armor. You will get crushed by HE shells from anything that has them and torched for the duration of most games. Currently, this is about 95% of the games considering the amount of HE being used, especially from certain battleships that spam it. Due to how often you will be using damage control to remove double fires, you are also quite vulnerable to the occasional flood from a torpedo hit. It's guns are okay and their layout has some benefits but are not reliable enough to make up for the weaknesses everywhere else. Also, you are a giant bucket of free experience points for an aircraft carrier. Expect to be farmed often in the rare event that one appears in your match, just as an added bonus. Izumo is a thankless POS. Hot garbage. Im really enjoying the Izumo, especially after the horid amagi grind of failing to pen full broadside cruisers, my only problem is the dispersion makes it pretty hard to deal high damage and theres not enough secondaries to make it viable to get close to other ships. I faced so many Izumo and I've never been really afraid of them. Sometime they scare me because I'm not expecting them to shoot at someone 20km away but the dispersion is so garbage they miss every shot. Every shot but one, but since they are Japanese guns that 1 will bounce no matter where it hits, why I even continue'd this line I still wonder. She isn't all that bad, considering she's much more accurate than her predecessors. It's just that the Yamato is better in just about every aspect and that MM screws her over too often by pitting her up against T10s. Play her like a larger Iowa and setup up in secondary build it worked for me. She needs to be played aggressively with this setup to get the best results. I have plowed through two caps killing DD's and cruisers this way on multiple occasions and I would end a lot of matches with at least two kills. 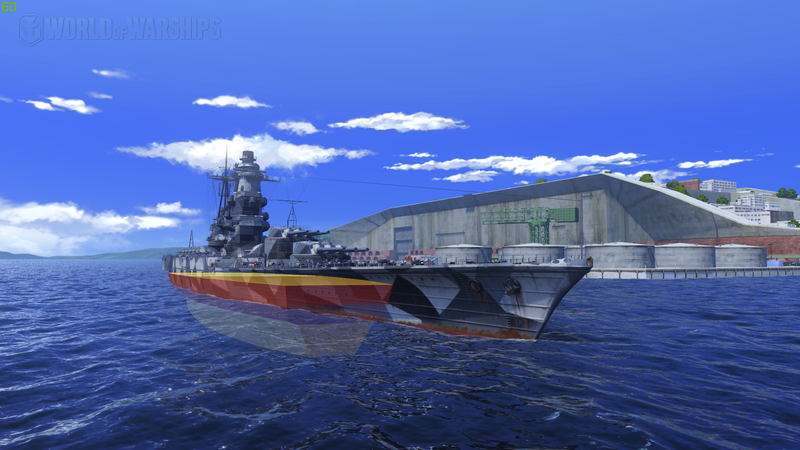 I am not a high win rate player , but I enjoyed Izumo more than I am enjoying Iowa. Izumo isn't bad. The strategy is just different . She is the first ijn bb that can really bow tank. Nagato can do it some I guess. But lessons learned from Izumo benefit Yamato. Nagato is tanky and can do it all. Yamato is mostly a bow tanker, but is very powerful.